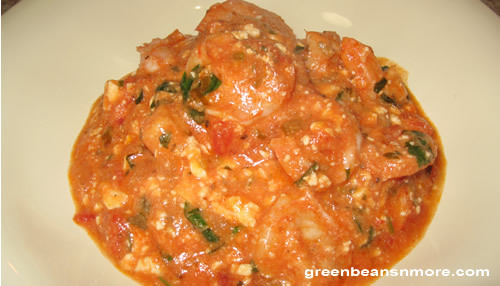 This recipe for shrimp in tomato, wine and feta is one of my favorite Greek foods. This particular recipe is very easy to prepare and is one where I've combined the favorite aspects of several different recipes. This recipe calls for the shrimp to be baked only. I've seen a lot of recipes that call for the shrimp to be sautéed, then baked in the sauce and feta. Not only is sautéing the shrimp a totally unnecessary step, both sautéing and baking can cause the shrimp to be overcooked. Another thing that gives this dish extra special flavor is the shrimp being tossed in the lemon juice. When I make this I peel the shrimp, and take off the tail. This may not be "authentic" but it's less messy at the table and easier to eat. You should ALWAYS devein any shrimp you use in a recipe. Peel the shrimp, remove the tails and devein. Rinse the shrimp and pat dry. Toss the shrimp with the lemon juice. Set aside to marinate. Heat the olive oil and butter in a 10 - 12 inch skillet over medium heat. Add the onion and garlic, cooking until the onions are soft, but not brown. Add the tomato puree, diced tomatoes, water or wine, oregano, salt and pepper and parsley. Stir well to mix and bring to a simmer. Simmer for 15 minutes. Taste again for seasonings. Use an oven -proof dish large enough for the shrimp to be placed in a single layer. Spoon a thin layer of sauce on the bottom of the dish. Place the shrimp and lemon juice in a single layer. Spoon the rest of the sauce over the shrimp. Sprinkle feta cheese over the the top. Bake, uncovered, for 15 - 20 minutes, until the shrimp are cooked through. Serve with crusty bread. *If you wish to add ouzo (instead of white wine) add 1/4 cup while the sauce is simmering. Ignite the ouzo carefully. Shake the skillet gently until the flame dies away. You would then only add 1/4 cup water.